Ground Linseed or Linseed Oil? Linseed Oil with Cottage Cheese? Linseed oil, also known as flaxseed oil, is made from the seeds of the flax plant. The oil contains substances which promote good health. Linseed and linseed oil are rich in alpha-linolenic acid (ALA), an essential fatty acid that appears to be beneficial for heart disease. ALA belongs to a group of substances called omega-3 fatty acids. Good health requires the right ratio of Omega 3 fatty acids to Omega 6 fatty acids in the diet. The ideal ratio is around 1:2. The average american diet is more around 1:20 to 1:50, with way too much Omega 6 and not enough Omega 3. The ratio present in linseed oil is about 4:1. So linseed oil is a good source of Omega 3. You should consume every day small portions of linseed or linseed oil. However if linseed oil is used in the diet for long time, without other oils, it may cause Omega 6 LA deficiency symptoms. So the best bet is to blend linseed oil with other oils that contain more Omega 6, in order to get the right balance, such as sesame oil, sunflower oil, evening primrose oil. Linseed oil is good for the heart because it is the richest source of alpha-linolenic acid. Linseed itself (ground or whole) also contains lignans, which may have antioxidant actions and may help protect against certain cancers, though not everyone agrees on this issue. Several studies indicate that linseed oil, as well as ground linseeds, can lower cholesterol, thereby significantly reducing the risk of heart disease. Taking linseed oil may also protect against angina (chest pain) and high blood pressure. In addition, a five-year study done recently at Boston's Simmons College found that linseed oil may be useful in preventing a second heart attack. It may also help prevent elevated blood pressure by inhibiting inflammatory reactions that cause artery-hardening plaque and poor circulation. Omega-3 fatty acids appear to limit the inflammatory reaction associated with these conditions. In cases of lupus, linseed oil not only reduces inflammation in the joints, skin and kidneys, but also lowers cholesterol levels that may be elevated by the disease. Taking linseed oil for gout may lessen the often sudden and severe joint pain or swelling that is a symptom of this condition. 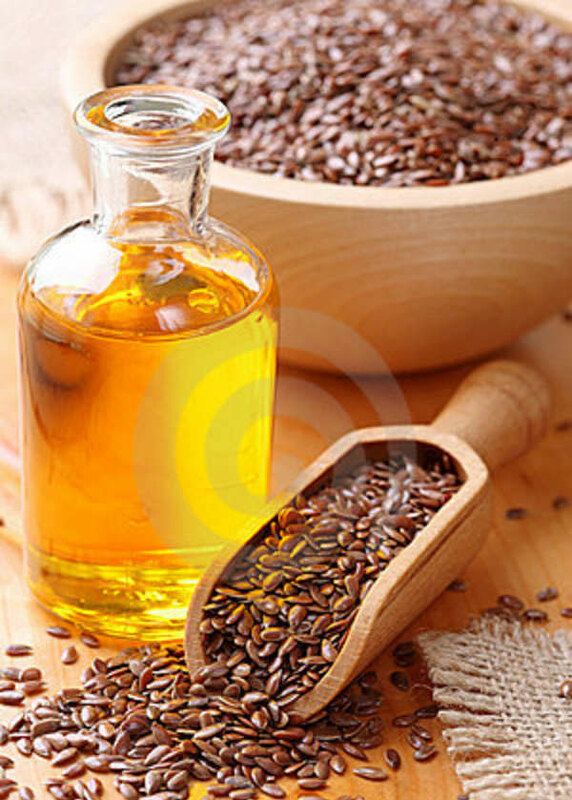 In addition, the ability of omega-3 fatty acids to boost the absorption of iodine (a mineral often found in low levels in women suffering from fibrocystic breasts) makes linseed oil potentially valuable for treating this often painful condition. As they are high in dietary fibre, ground linseeds can help ease the passage of stools and thus relieve constipation, haemorrhoids and diverticular disease. In those with diverticular disease, linseeds may also keep intestinal pouches free of waste and thus keep potential infection at bay. Taken for inflammatory bowel disease, linseed oil can help to calm inflammation and repair any intestinal tract damage. In addition, the oil may prevent painful gallstones from developing and even dissolve existing stones. The essential fatty acids in linseed oil are largely responsible for its skin-healing powers. Red, itchy patches of eczema, psoriasis and rosacea often respond to the EFA's anti-inflammatory actions and overall skin-soothing properties. Sunburned skin may heal faster when treated with the oil as well. In cases of acne, the EFAs encourage thinning of the oily sebum that clogs pores. The abundant omega-3 fatty acids in linseed oil have been shown to contribute to healthy hair growth (in fact, low levels of these acids may cause dry and lackluster locks). Hair problems exacerbated by psoriasis or eczema of the scalp may respond to the skin-revitalizing and anti-inflammatory actions of linseed oil as well. Similarly, the oil's EFAs work to nourish dry or brittle nails, stopping them from cracking or splitting. The EFAs in linseed oil assist in the transmission of nerve impulses, making the oil potentially valuable in treating conditions of numbness and tingling. The oil's nerve-nourishing actions may also help in the treatment of Parkinson's disease, a degenerative disorder of the nervous system, and protect against the nerve damage associated with diabetes and multiple sclerosis. The lignans in linseed appear to play a role in protecting against breast, colon, prostate, and perhaps skin cancer. Although further studies are needed, research undertaken at the University of Toronto indicates that women with breast cancer, regardless of the degree of cancer invasiveness, may benefit from treatment with linseed. Interestingly, the lignans may protect against various effects of ageing as well. Because the hormone-balancing lignans and plant estrogens (phytoestrogens) in linseed help stabilise a woman's estrogen-progesterone ratio, they can have beneficial effects on the menstrual cycle, and relieve the hot flashes of perimenopause and menopause. linseed may also improve uterine function and thus treat fertility problems. In addition, the essential fatty acids in linseed have been shown to block production of prostaglandins, hormonelike substances that, when released in excess amounts during menstruation, can cause the heavy bleeding associated with endometriosis. Liquid linseed oil is the easiest form to use, although it must be kept refrigerated. It is available either in liquid form, or in capsules. If you prefer to use ground linseeds, just add 1 or 2 tablespoons of to an 8-ounce glass of water and mix. linseeds have a pleasant, nutty flavor and taste good sprinkled on salads, cooked vegetables, or cereals. I recommend you grind the seeds (or buy ground linseed) because whole seeds simply pass through the body. Grinding the seeds just before using them best preserves flavor and nutrition, but pre-ground seeds are more convenient. Keep them refrigerated. There are no nutritional differences between brown and yellow seeds. For best absorption, take linseed oil with food. It is easily mixed into juices and other drinks, and its nutty, buttery flavor complements cottage cheese, yogurt and many other foods. You can also use it instead of olive oil in a salad dressing. Don't cook with it, however, as this will deplete the oil's nutrient content. Buy linseed oil in an opaque plastic bottle. This will prevent light from spoiling it. Also check the expiration date on the label, as the oil spoils quickly. Keep it refrigerated for freshness. Should the oil develop a powerful odor, discard it. No doubt, linseed oil is among the richest plant sources of omega-3 fatty acids (to be more specific, omega-3 alpha linolenic acid). This oil is found to have considerable amounts of vitamin E, omega-6 and omega-9 fatty acids and various phytonutrients. Being a good source of nutrients, linseed oil has been promoted as a nutritional supplement. While the use of linseed oil is surging steadily, most of the users are ignorant of the possible side effects of this product. Though, linseed oil is said to have various health benefits, it is also contended that the nutritional value of this oil is much lesser, as compared to the whole seeds. Here is a compilation of some of the possible linseed oil side effects, some of which could be serious. One of the common, but less bothersome side effects of linseed oil is loose stools that may sometimes lead to diarrhea. This side effect is often associated with slightly higher doses. Linseed side effects like bloating and flatulence is not usually seen in linseed oil users as the latter product has meager fiber content. Some of the flax oil users may develop serious allergic reactions with symptoms like rash, hives, itching, swelling, breathing problems, wheezing, etc. Linseed oil side effects include bleeding problems, as it may adversely affect the blood clotting ability of the body. It could be like brain hemorrhage (causing symptoms like, headache, numbness and tingling in limbs, vision problems, etc.) or bleeding in the gastrointestinal tract (causes reddish or black tarry stools/vomiting blood). Some people may experience easy bruising or cuts that bleed for long. Though alpha linolenic acid (ALA) is healthy, in some cases, it does not get converted into eicosapentaenoic acid (EPA) and docosahexaenoic acid (DHA) that are readily absorbed by the body. This is mostly seen in people with medical conditions like diabetes. It is said that in normal cases too, only 1% of the total omega-3 alpha linolenic acid (in linseed oil) gets converted into EPA during metabolism. Flaxseed oil contains alpha-linolenic acid (ALA), and research suggests that diets high in ALA from meat and dairy may increase the risk of prostate cancer. However, this does not seem to apply to plant-based ALA, such as that found in flaxseed oil. Flax oil side effects include possible drug interactions. Those who are taking blood thinning medications should should not use linseed oil or flaxseed oil (alpha-linolenic acid or ALA) or other omega-3 fatty acids without first talking to your health care provider. This applies to other types of drugs like, blood sugar lowering ones, NSAIDs, medication for lowering blood cholesterol, cyclosporine, etc. Avoid using linseed oil, if you are taking laxatives. You shouldn't use linseed oil to cook since the heat changes the healthy fat into toxic fat that causes harm. Instead, most people find that adding the oil to a dish that's already cooked can enhance the flavor and add many beneficial nutrients to the diet. Linseed oil is found to turn rancid (due to oxidization), once it is exposed to light or air. Do not expose the oil to light or air, if it turns rancid the oil is not healthy to consume. Store in a dark cool place, and always make sure it is properly sealed. Linseed oil contain phytoestrogens that may act like the original hormone (estrogen), in the body. So, it should not be used by pregnant and breastfeeding women and those with hormonal imbalance. Others too must use this product in moderation. Animal studies have indicated that linseed oil intake during pregnancy may affect the fetus. It is unknown whether it would have the same effects on humans since no human studies have been made. Others however claim that it's safe to consume linseed oil in normal amounts during pregnancy and breastfeeding. Because there are contradictory statements about the safety of linseed oil, it is always best to talk with your healthcare provider before consuming linseed oil during pregnancy or breastfeeding. Immature flaxseed pods can cause poisoning. Uncooked flaxseed also contains very small amounts of cyanide compounds, especially when consumed raw. Heat, especially on dry flaxseeds, breaks these compounds down. (However, our bodies have a capacity to neutralize a certain amount of these compounds, and the U.S. government agencies say that 2 tablespoons of flaxseed (~3 T of flax meal) is certainly safe and is probably an "effective dose" for health purposes. Various researchers	who have used up to 6 daily tablespoons of the seed in different studies indicate that the amount they were using was safe.) If you want to reap the benefits of flaxseed without the risk of toxicity, consider using flax or linseed oil. Once flaxseed is pressed into oil, the cyanogenic glycosides become inactive. While some studies support these above side effects, others reject them. So, it is always better to use linseed oil, as per the advice of your doctor. It is highly important to stick to the prescribed doses. Most of the possible linseed oil side effects are said to be caused by high doses. So, moderate use is always recommended. Dr. Johanna Budwig is known and highly respected around the world, as Germany's premier biochemist. Over the years she has published a number of books including "Flax Oil as a True Aid Against Arthritis, Heart Infarction, Cancer, and other Diseases". In the mid 1950's, Dr. Budwig began her extensive research on the benefits of linseed because of its rich essential fatty acid content known as "linoleic and linolenic". Dr. Budwig assisted many seriously ill, even those who were given up for terminal by orthodox medical doctors, helping them to regain their health through a simple regimen of linseed oil blended with cottage cheese. Dr. Budwig supplemented her patients' diets with 2 tablespoons of linseed oil combined with 1/4 cup of cottage cheese. Dr. Budwig found that a yellowish green substance in their blood was replaced with a healthy red pigment, hemoglobin. She also found that the tumors receded and disappeared, anemia was alleviated, and vital energy was regained. Why cottage cheese? Linseed oil is made more effective when 2 tablespoons of the oil are added to 1/4 cup of cottage cheese. The essential fats bind to the proteins in the cottage cheese making them more easily absorbed by your body. My eye doctor recommended 2000 mg daily about 5 years ago because I have chronic dry eye and a bad result after lasik surgery. At first, I had diarhea but then my body got used to it. Now I never suffer from constipation when I take the pills. They also really worked for my eyes. I had an amazing recovery from the surgery and I think the flaxseed helped. Also I recently had a baby and am nursing. My OB and Baby doctor know I take flaxseed and said it was fine during pregnancy and nursing. She is a smart little girl. Maybe the DHA in flaxseed helped. Been taking in oil form for 6 months. results lowered my bad cholesterol, overall cholesterol and dropped triglicerides. total cholesterol was 389 now 162. i fell much better mentally and physcially than I have in years. also helped swelling due to oseo. I have been having an increasing number of hot flashes, which have kept me awake at night. Not wanting to take hormones or black cohosh I came across information on flaxseed oil. I started taking two 1200mg caplets of flaxseed oil for a week, and have noticed a significant improvement in just a couple of days. I take flax seed oil for knee and joint pain. Since I started about 6 months ago, my joints don't pop anymore, the pain is gone, and I'm able to exercise again. I did notice the difference in the grade used. I started out buying Nature's Way and my symptoms remained the same. My friend told me to try the Vitamin Shoppe brand certified organic 1000mg; I noticed a dramatic difference in just a few days. It's definitely worth a try, flax seed has helped everyone I know. I had laser surgery on my eyes 2 1/2 years ago and was told by the doctor to take flaxseed oil for eight weeks. I benefited much more from this regiment than I recognized. I noticed that when I wasn't taking flaxseed that my knee joints would ache. When I would continue to take fS the stifnness would subside. The hot flashes that I was having are gone. I didn't know that FS had so many benefits for my body personally. FS has become a regular dietary supplement for me. I cannot remeber the exact reason the doctor advised me to take this supplement as I had several health issues at the time one of which was ance. Which i've suffered from since my teenage years and I am now 30. I have only been taking flaxseed oil along with cod liver oil for about a month or so now. And it has done wonders for my skin. My skin is 97% clear the majority of the time. This is after I had been on antibiotics and countless topical creams over the years which would work about 70-80%... I occasionally will breakout near my period but even so its no where as bad as it previously was. So I would highly recommend this to anyone who is trying to get their facial ance under control as I had been for so many years.